I love using my Silhouette, so for this months challenge at Penny Black @ Allsorts, I decided on an oval card with the butterfly attached. The stamp is Penny Black Make a Wish (t-set). Copics and watercolor pencils used as well as Stickles. 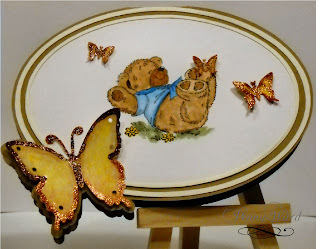 Gorgeous creation, thanks for joining Penny Black @ Allsorts challenge, good luck. Beautiful card and the butterfly looks great,thanks for joining us at Penny black at Allsorts. Lovely card with gorgeous butterfly! How beautiful! Love the oval shape and how you added the butterfly to the side! Thanks so much for sharing with us at penny black at all sorts! What an adorable card Penny, just beautiful. Thanks for sharing with us at Penny Black at Allsorts and good luck.